How is it the end of March already? My mind boggles. 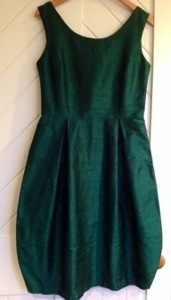 I’ve done a reasonable amount of sewing this month, which has been satisfying. 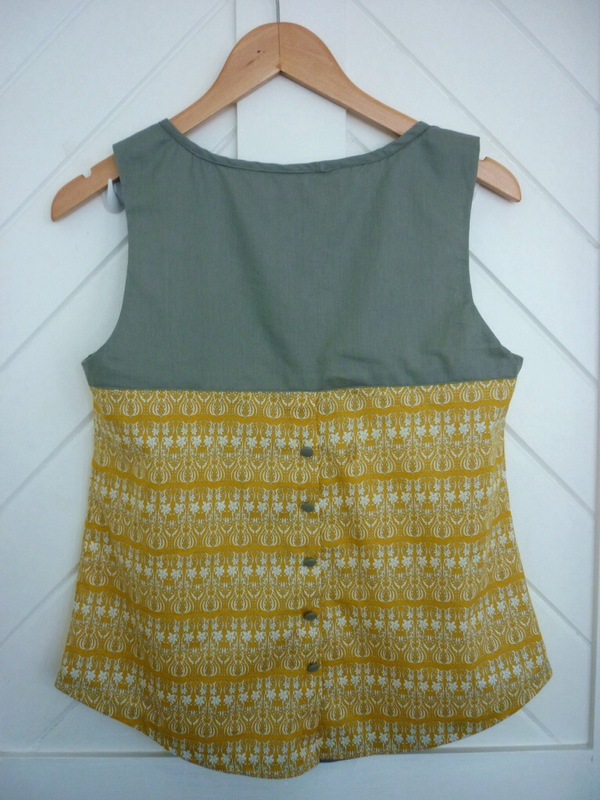 Its been a rather eclectic bunch of makes though, from winter accessories to a summer blouse! A refashioned pair of tights. 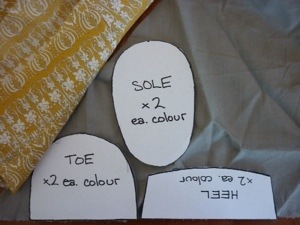 I’ve been pretty thrifty with fabric, with both the scarf and the wee shoes being made from scraps from other projects (the scarf from my briar leftovers, and the shoes from the cotton scraps off my Datura), and i think I’ve done some of my neatest sewing this month. So I’m pretty happy with everything, really! Its a pretty average photo, because its after dark (and theres only ‘mood lighting’ in this house), but it gives a rough idea! It turns out that all of my ‘summer is dead! The long winter has come!’ angst of last week may have been a bit premature, because its been sunny all week! 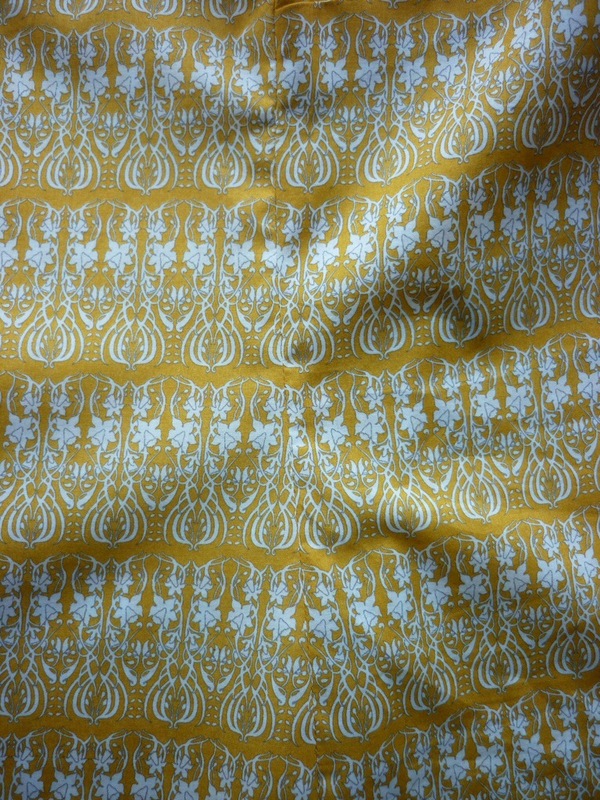 So sunny, in fact, that I decided to pull out my Deer and Doe Datura pattern and make it up. That seam is straight, i promise! Its just on the hanger a bit wonky. It was a rather serendipitous project, really. i was at Spotlight (don’t judge me! I only go there when i have to!) looking for some cheap fabric to make a wearable muslin for my Grainline Archer shirt, when I found this beautiful Japanese cotton. 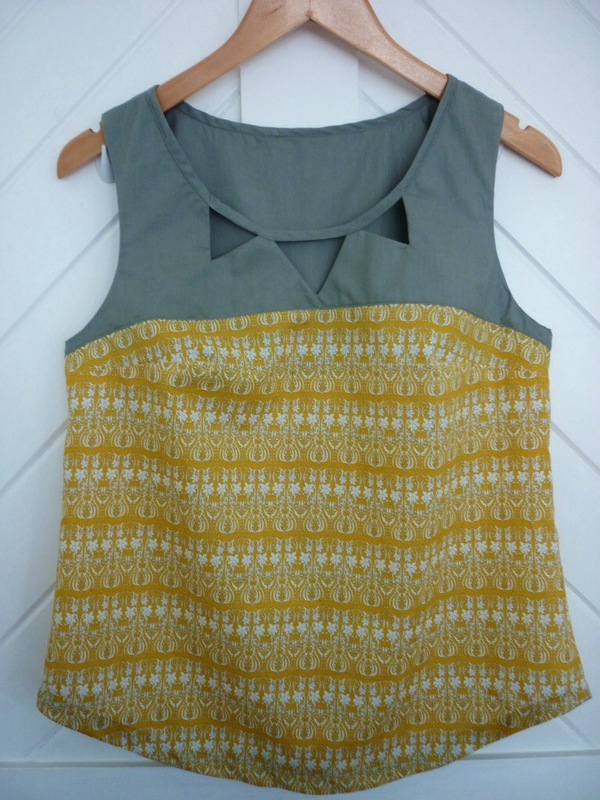 Mustard and grey! Art nouveau daffodils! Its like my dream fabric! And there was a bolt of perfect grey cotton lawn sitting right next to it! I knew I needed to make something out of it, and my poor Datura pattern has been filed away unmade…(I never did get fabric for my Archer, I’ll need to have a look at the Fabric Store next time I’m up that end of town). Seriously, how amazing is this fabric! 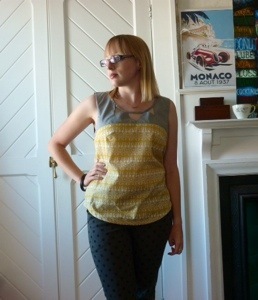 I’m also pretty proud of my pattern matching down those side seams. I would never manage to match it up perfectly, i was just trying to line up the stripes, but I think it turned out pretty well. I have to say, this pattern was so much fun to sew up! It all just went together so neatly, and all of the seams joined up so perfectly, and its so tidy inside, it was a joy to make. Its easily the nicest thing I’ve ever sewn, in terms of both construction and fit. I’ve always been a bit haphazard with things like finishing seams and making everything neat and tidy, so thats something I’ve been really working on. 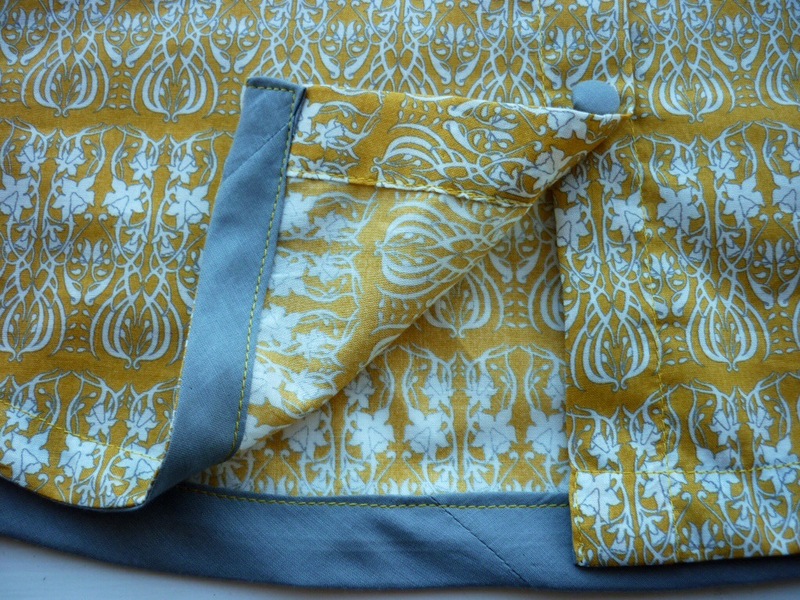 The construction of the yoke is brilliant, with everything all neatly tucked away within the lining. I also was very careful with my topstitching around the neckline and the bias bound hem, and I’m really pleased with how it turned out. I’ve just noticed how big my hands look in this photo, now I can’t stop staring at them. They’re not actually massive, I wear size 6 gloves! 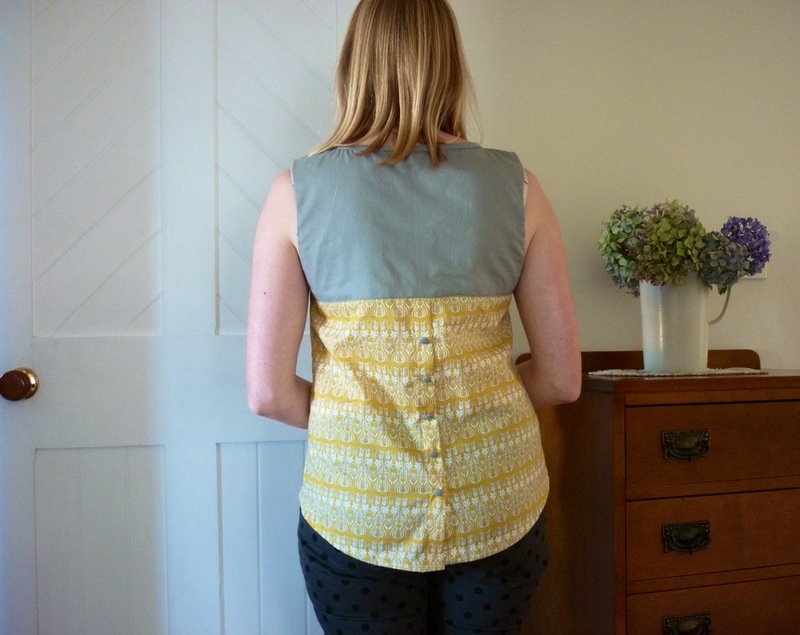 I used fabric covered buttons down the back, but I didn’t bother doing button holes as the top is roomy enough to pull over my head without them (which is ace, because I’m not great at button holes. Another thing to practice before my Archer!). I used five buttons in the end, because they’re so small that three looked a bit silly. 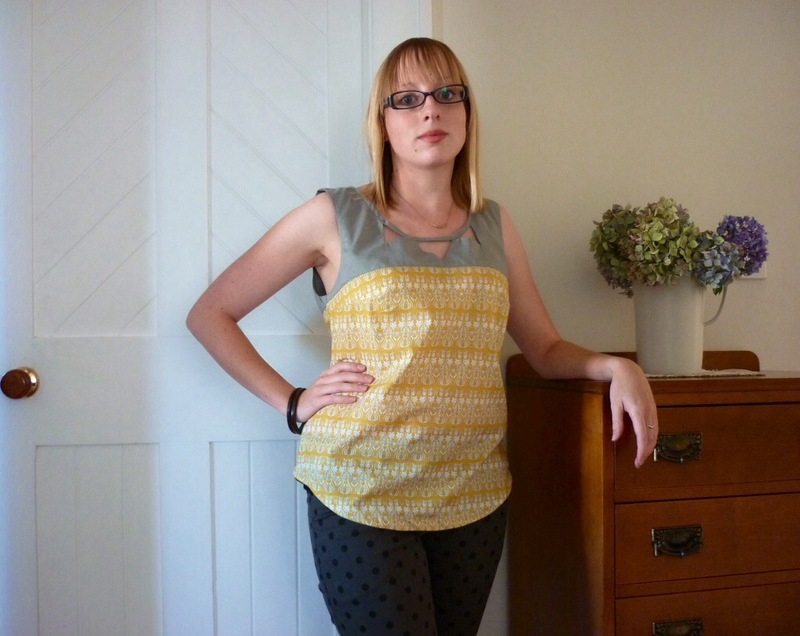 I’ll definitely be making more of these tops for next summer, I like the idea of a mix of black and white or grey and white spots and stripes, maybe with some piping along the seam between the yoke and the rest. So many possibilities! Next time I’ll take a bit of fabric out of the centre back, to minimise some of the gape. Theres apparently a small back adjustment tutorial online somewhere, I’ll need to track it down and see what I can do to fix my upper back gaping issues! I’ve never done a bias bound hem before, its a nice neat finish. I really enjoyed this project, its the first major thing I’ve sewn since my Jasmine blouse and it was a much smoother, happier experience! I have a couple of fairly ambitious sewing projects coming up, with the Archer shirt and an Elisalex dress by By Hand London both on the cards. Exciting times!